Arrangements for the evacuation of the wounded from the British Front line trenches occupied by the 46th Division from July to September 1915. 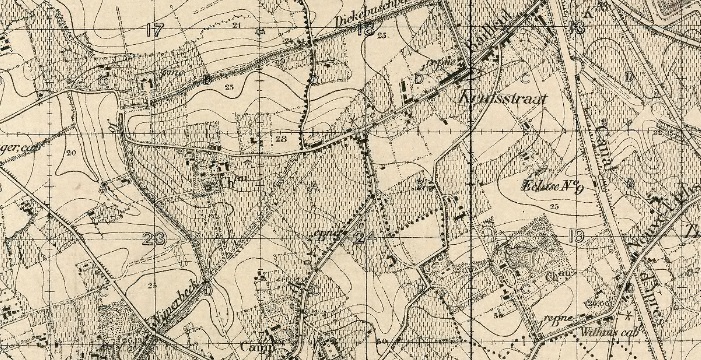 The line held by the 46th North Midland Division extended from I.18d.10.10 (top right in Sancturay Wood) to I.34.b.9.9. (bottom left on the Hollebekke Road). The line to I.30. evacuated its sick and wounded to an Advanced Aid Post (AAP) where the Field Ambulance had 1 N.C.O. and 8 men in a dug out at I.24.a.2.2. This AAP was situated in Maple Copse and was likely to have been the place for Trench Burials. 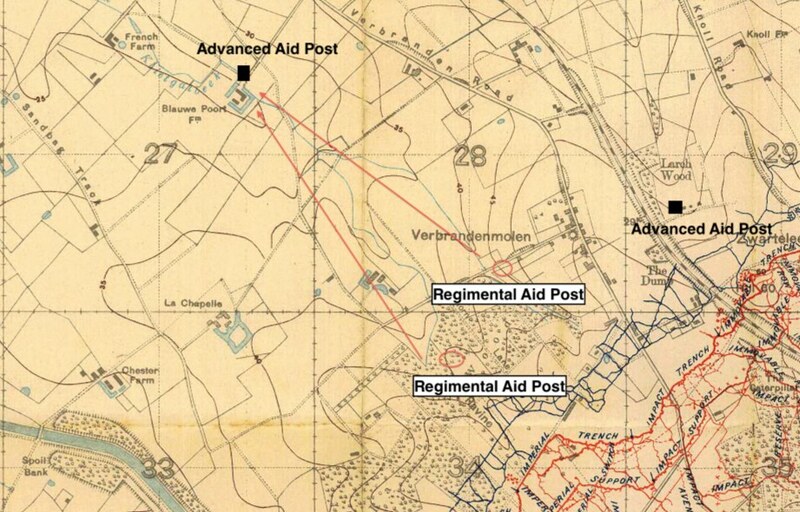 The line south of this evacuated to two Advanced Aid Posts to which the stretcher bearers of the the Field Ambulance went to collect the wounded at I.29.c.3.7. (Larch Wood) and I.27.b.5.5. (Blauwe Farm). The Artillery Batteries of the 46th Division also sent their wounded to the same AAPs. 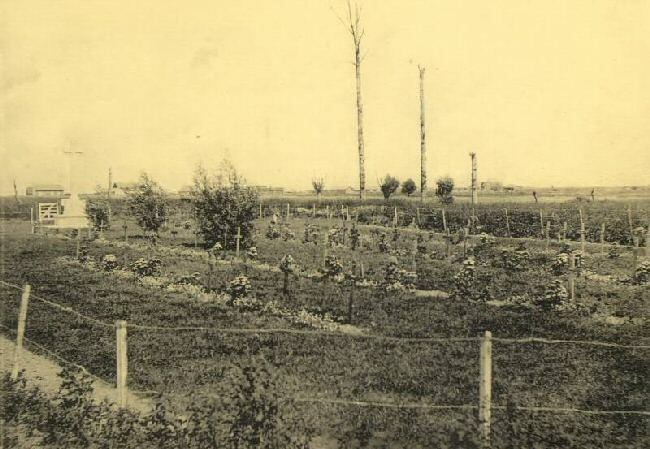 Blauwe Farm would later become the site of Blauwepoort Farm Cemetery, which now contains the graves of 80 soldiers. 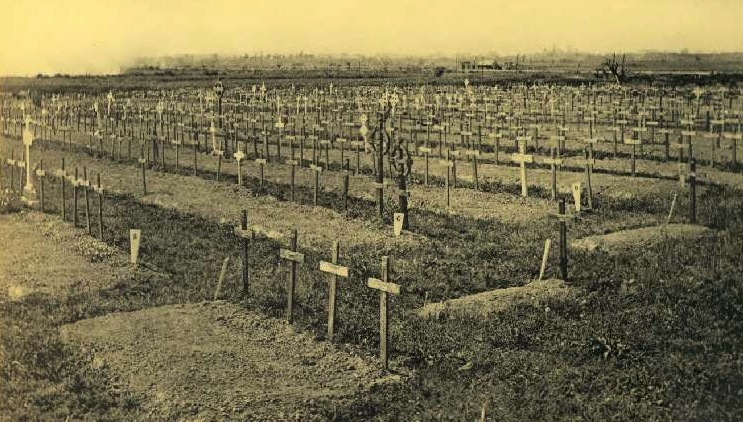 The 1/6th North and 1/5th South Staffs of the 137th Brigade primarily buried their dead here in Row D (graves 1 – 20). 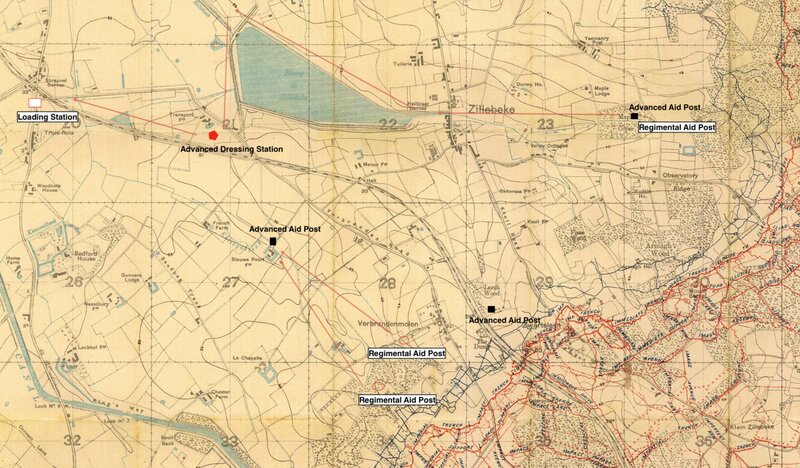 Two main Advanced Dressing Stations (ADS) were also established at H.24.a.7.9. and I.21.c.8.8. At H.24.a.7.9. there were two very large dug-outs and a smaller one. The largest acted as a dressing station where the equipment of the Medical Store Cart was set out. The other dug-out housed 30 N.C.O.s and men and 2 Officers. The Transport Section, which comprised two Motor Ambulances were parked at H.23.b.4.8. (This ADS may well have been located in the Convent School in Brandhoec). Casualties that reported to Maple Copse were sent down singly to the N.W. corner of Zillebeke Lake, with the N.C.O telephoning to the ADS at H.24.a.7.9. that they had started out. Bearers with wheeled stretchers then started from H.24.a.7.9. to meet them, going by Bridge 14 and then almost due East to the N.W. corner of Zillebeke Lake. At this point the bearers changed over and returned to their original starting points. On arrival at the Advanced Dressing Station at H.24.a.7.9. the wounded men were dressed and evacuated to the Dressing Station at G.26.c.3.3. by Motor Ambulance. As the Motor Ambulances passed the Headquarters of the Collecting Field Ambulance at G.20.c.4.8. another Motor Ambulance was sent to H.24.a.7.9. The evacuation of wounded soldiers by this scheme proceeded throughout day as required. At night 2 or 3 Horsed Ambulances went to Maple Copse and arrived at about 10 p.m. At this time they loaded up with sick and wounded and returned immediately. In addition 6 to 8 Motor Cars went to H.23.b.3.8. and arrived at about 10 p.m. for the evacuation of these wounded men and also those from the Southern Sector. The 2nd Advanced Dressing Station was in located in dug-outs in the north bank of the Railway Embankment at I.21.c.8.8. and two Medical Officers with 50 stretcher bearers and the equipment of one Medical Cart were stationed there. The ADS in I.21 was located close to Transport Farm, which was later to become Railway Dugouts Burial Ground (Transport Farm). During the day only the walking wounded could be sent from the Regimental Aid Post at I.29.c.3.7. 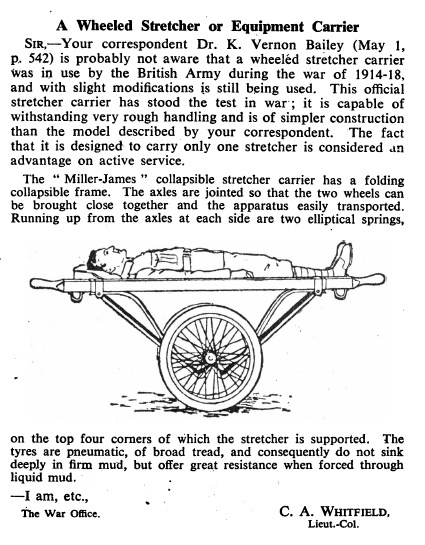 because the Communication Trench was not big enough to allow the use of stretchers. Stretcher cases were only collected from here at night. Two Regimental Aid Posts (RAPs) were established at I.28.d.2.3. and I.34.a.8.8. from which the Regimental Stretcher Bearers carried wounded men during the day and night to the Advanced Aid Post at Blauweport Farm at I.27.b.5.5. when the Field Ambulance bearers took over. 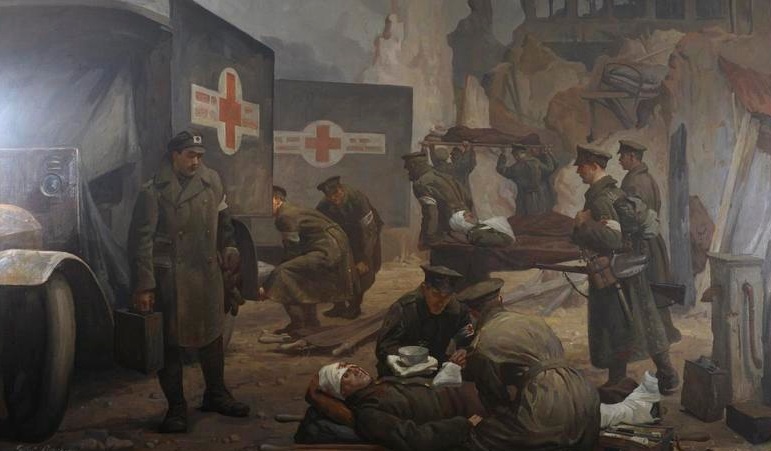 Wounded men from these RAPs were then moved to the Advanced Aid Post in a large dug-out in the Railway Embankment and their wounds dressed if necessary. A cyclist orderly was then dispatched from the Railway dug-outs to the Motor Ambulance Park at H.23.b.4.8. A car then proceeded to the Loading Station at I.20.a.5.3. 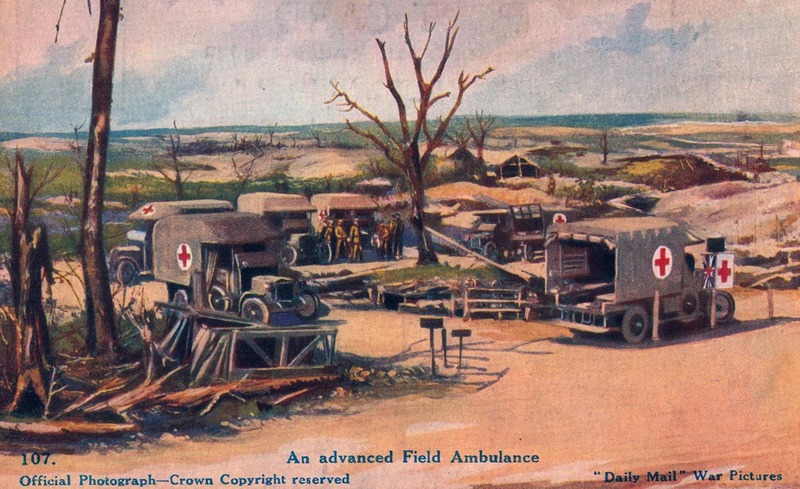 The wounded men are then moved by wheeled stretchers along the North bank of the Railway embankment to this loading station and transferred to Motor Ambulances. A Motor Ambulance reminds at this point from 10 p.m. to 3 a.m. each night. 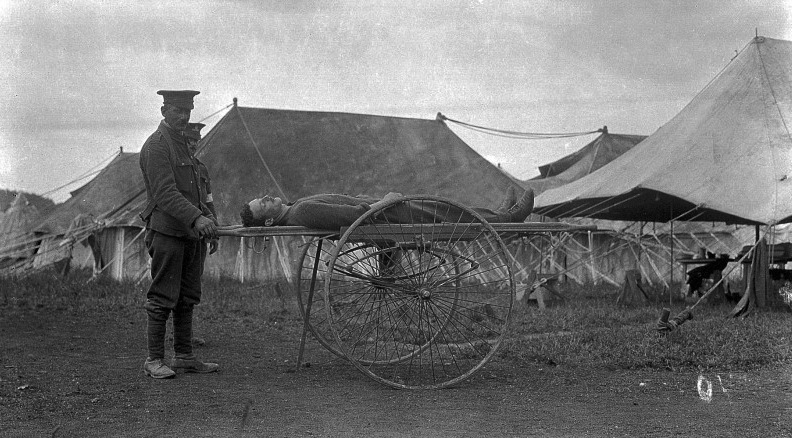 Wounded British soldiers, swathed in bandages and lying on stretchers, are in the process of being moved onto two waiting motor ambulances by orderlies of the Royal Army Medical Corps. The vehicles are on the left and some of the ruined buildings of Ypres are visible on the right. Imperial War Museum © IWM (Art.IWM ART 3792). 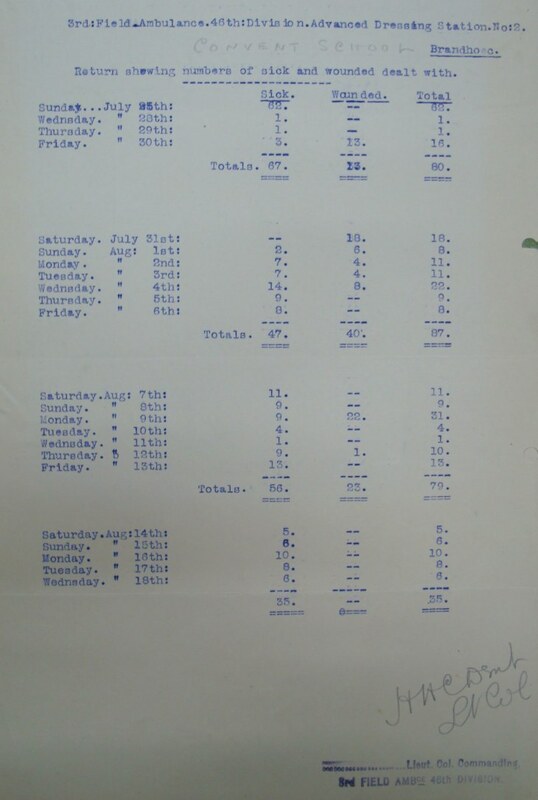 However, the War Diary records different locations for the burials at 28.I.34.A.7.7. and 28.I.34.C.7.7. The burial of 2020 Joseph Hudson at 28.I.34.A.7.7. is very close to the Regimental Aid Post and suggests that the recording of 28.I.34.C.7.7. 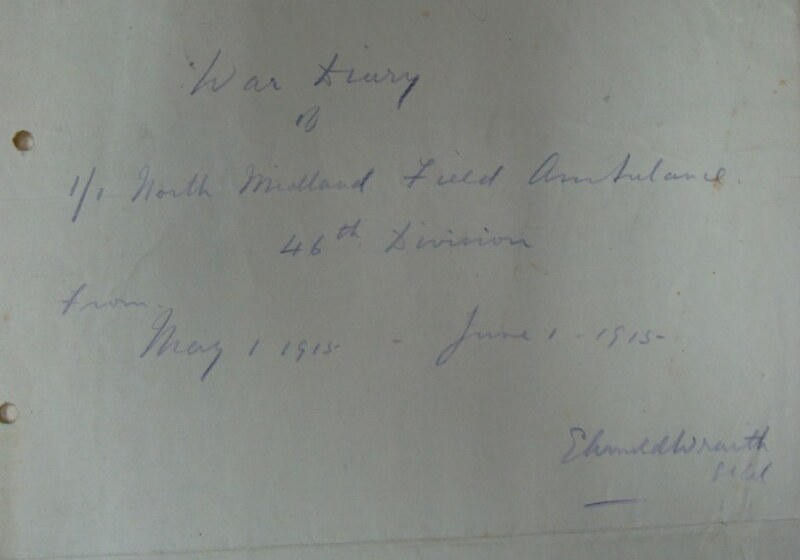 in the War Diary is perhaps a mistake and all the men were buried in the same place. The 1/8th Sherwood Foresters buried 4 men in what is now known as Woods Cemetery. 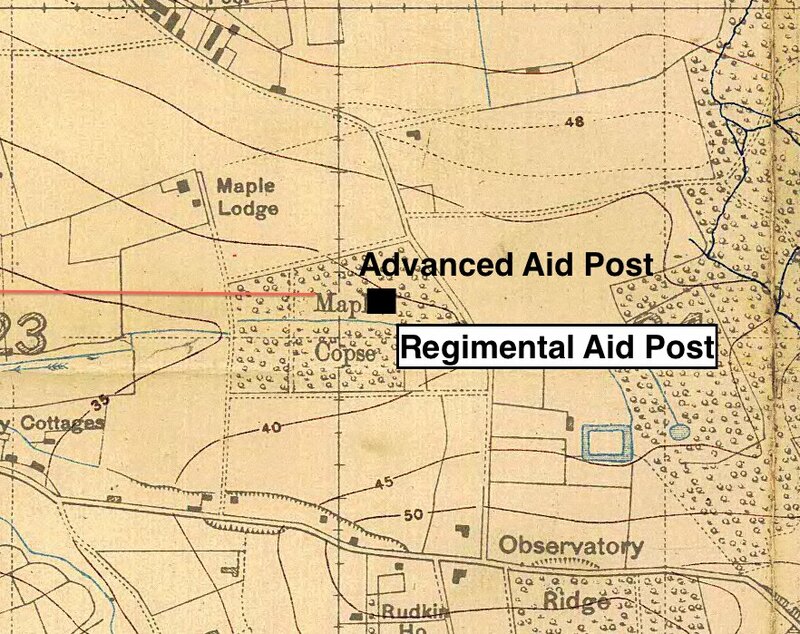 The location of which is very close to the Regimental Aid Post at I.28.d.2.3. The 1/6th Sherwood Foresters used both Chester Farm and Spoilbank Cemeteries for their burials, along with the 1/5th Sherwood Foresters.